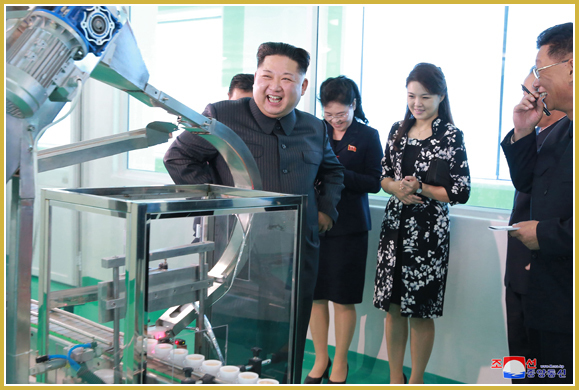 Kim Jong Un, Chairman of the Workers’ Party of Korea, Chairman of the DPRK State Affairs Commission and Supreme Commander of the Korean People’s Army, together with Ri Sol Ju, gave field guidance to the Pyongyang Cosmetics Factory which has turned into a model and standard for the nation's cosmetics factories. After seeing the mosaic painting of Chairman Kim Jong Il, titled, "To Provide Our People with Better Cosmetics," Supreme Leader Kim Jong Un went round the newly arranged room for education in the revolutionary history and the room dedicated to the history of the factory. Looking carefully at each picture of Kim Jong Il giving field guidance to the factory in August 2003, he said that the Chairman would be very glad to see the factory renovated finely. All the places of the factory are associated with the love for the people by Kim Jong Il who made efforts to provide them with more civilized living conditions, he said, calling upon its officials and employees to produce more cosmetics of good quality with a world-class competitive edge and provide people with them, always remembering on-the-spot instructions given by Kim Jong Il on the day. He went round the integrated production control room, cosmetics, soap and cosmetics vessel workshops, design room, cosmetics institute, cosmetics analytical laboratory, sci-tech learning space, sample room and other places to learn in detail about renovation, production, research and quality of goods. He was very pleased, saying the varieties of cosmetics are numerous and qualitative, and that not only their vessel patterns but packing boxes are very nice. He said with pride that he was very pleasant to think of our women and people who would be pleased after receiving world-level cosmetics produced at the factory which has been put on a modern, scientific and industrial basis, pointing out that it has come to realize the dream of women who want to be more beautiful. Noting that the districts for production, education and workers' living have been clearly distinct, all its buildings arranged into green and energy-saving ones and everything face-lifted radically, he said he felt good as the factory has been remodelled to be proud of in the world so that it would be flawless in the distant future, too. He put forward important tasks facing the factory and directly gave a task for modernizing its second-stage production process. Expressing his expectation and belief that its officials and employees would make continued innovation and advance in the drive to provide people with good quality cosmetics, he had a photo session with them. He was accompanied by An Jong Su, vice-chairman of the WPK Central Committee, and Kim Yo Jong and Jo Yong Won, leading officials of the WPK Central Committee.